Having recently, in the last five years added to my repertoire baking and pastries, I have become quite proficient in professional kitchens with making bread. So today just for kicks and with the thought in mind of making adjustments from industrial equipment to residential for the benefit of showing future classes this lesson, I set out to make a small batch of French bread. In the process of converting one of my reliable stand-by recipes from bulk to a smaller more manageable one for the home baker, I made a few errors and ended up with an over-hydrated dough which degassed during the second rise. Had I been wanting to make a ciabatta or a focaccia, the result would have turned out just fine. 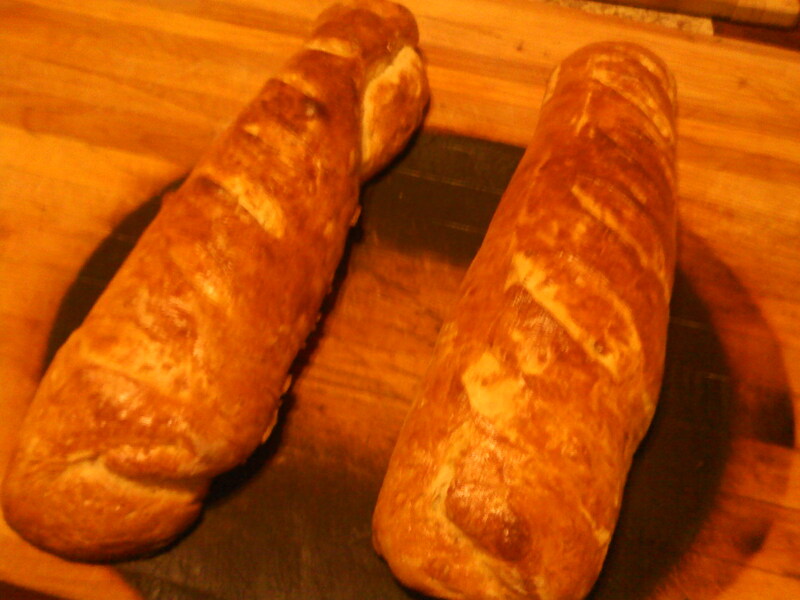 Unfortunately, the baguettes I had formed lost shape and fell flat. After some re-figuring, I made a few corrections and I was going to wait until tomorrow to fire another batch, but since I’m a bit of a night owl, I went ahead and started a new dough to which I will report felt much nicer and is going through the initial rise as I write this post. It should be doubled in size by around 2:00 a.m. and ready for portioning and then the secondary rise. This recipe is very basic with only four ingredients. The challenge is the fermentation process and handling the dough properly. Combine all ingredients in mixing bowl (…if you have a nice mixer like a Kitchen Aide, use the dough hook attachment) and mix for 7 to 10 minutes on medium speed. You don’t want to over-work the dough, just enough to get the proteins in the flour to get hydrated and take shape. The dough will form a “ball” and “climb” the hook and the sides of the bowl should be dry and the bottom slightly sticky. Scrape the dough from the bowl into a clean bowl lightly sprayed with oil or apply oil to a clean paper towel and wipe the bowl. Place your dough in the bowl and cover with plastic and allow to rise at room temp until doubled in size. This will take time, so be patient. Don’t try to hurry it along. Bread takes time so if you want fresh bread on Tuesday evening, start this early Tuesday morning. Once the first rise is achieved, you may now portion it. With a knife, carefully cut into pieces weighing about the same. I would recommend going with a baguette the first time(s) you try this. It’s an easy shape to achieve. Simply lay the piece of dough flat and “fold” like you would a letter. pinch the seam you have made together and roll back and forth from the middle out to the ends until about 2″ in diameter. The dough should feel tight and compact. Place on a parchment lined baking sheet lightly sprayed with oil or cooking spray. With a very sharp blade or clean razor blade, gently score the top several times in a diagonal motion. A score is very light and NOT a cut. This allows some gas to escape during the second rise and also adds a nice look to the finish bread. The second rise won’t take as long as the first, maybe only about 30 to 40 minutes. In a preheated oven up to 550 if your can reach that high (500 is fine too, just keep an eye on it…), place the baguettes in the oven with a metal pan with water on the level underneath the bread. The bread should turn golden brown within about 8 minutes or so. If you notice uneven color at this point, rotate 180 degrees and continue baking for about another 10 to 15 minutes. Keep an eye on it until you “get to know” your oven…all ovens are not created equal! If you have a thermometer, the internal temp should be within a couple of degrees of 205 Fer. Move to a cooling rack and enjoy! Feel free to contact me if you have any questions.